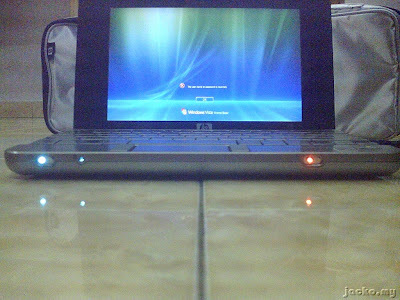 Let's conclude this wrestling between MSI Wind and HP Mini in this post. Clearly, 1 Ferrari 1 Potong. Hehe... In fact it's not that bad, just more than half a minute different. But, let's try hibernate them and re-power on with IE window opened on both chicks prior hibernation. Again, Mini goes first and Wind tailgates her. Once more, Mini losses big time to Wind, this time really Ferrari versus Viva Kancil. If you think hibernation is not important, you might be wrong. 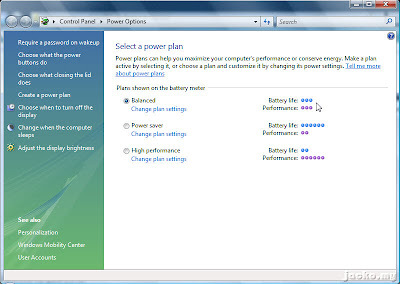 When the netbook is used till the battery drains out to the very last drop, Windows will force a hibernation to save your current operating state so you can resume the work after you charge the battery. Of course it can be configured to force shut down and all your unsaved works will be just gone like that. I also mentioned earlier that I feel Wind is running faster than previously when I first installed Vista. With this video, seems like Wind was about 10 seconds faster than previous. Boot time may not illustrate the whole performance. As I did not want to load any benchmark software like other technical review 'cause the produced numbers may not bring any meaning to non-techie, so I ran a full virus scan (practically everyone would do this right?) using Eset NOD32 AV on both machines. Out of topic a bit, Eset might not be as well known as other big names such as Kaspersky, Symantec or Norton, McAfee and Trend Micro's PC-Cillin, but it's proven to me as an effective and efficient AV product to provide not only virus and email (malware etc) protection, also internet browsing protection, it's an all-in-one protection. 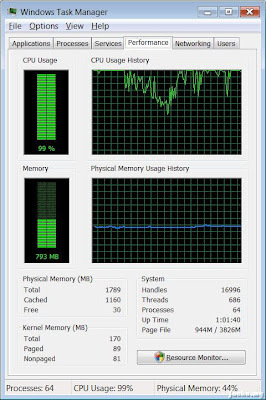 The major factor is, it consumes very little CPU processing power and memory compare to other brands, this is crucial for a netbook to run faster. I couldn't imagine how's the performance if Norton All-in-One or Norton 360 is loaded onto Mini or Wind. 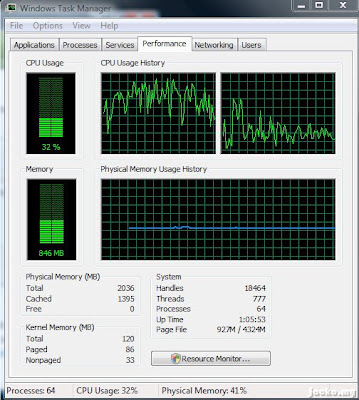 Mini's CPU was almost over the top throughout the scan whereas Wind was just relaxing with average 30-40% of CPU utilization with both running similar amount of processes (total of 64). You can also see there are 2 CPU graphs on Wind but only one on Mini. Atom has Hyper Threading (HT) that makes Vista to treat it as 2 CPUs in Wind than a single CPU in Mini's VIA C7-M CPU (without HT). Hence, faster response and better performance by Wind. 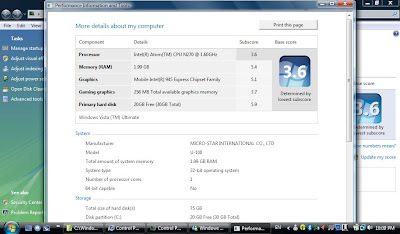 Another note, both are equipped with 2GB RAM but Mini only detects 1789MB physical memory wherease Wind has 2036MB. Theoretically it shouldn't be any difference even with different edition of Vista, the core foundation of Vista should be identical across the editions, so I guess it's due to the hardware architecture difference that makes Mini detected lesser RAM but I am yet to find more supporting facts (this isn't a technical review). 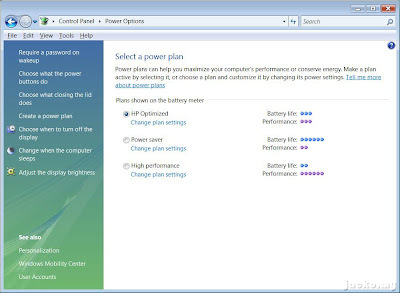 To access WEI, go to Control Panel follow by Performance Information and Tools. Click on "What do these numbers mean" to learn more about WEI. Basically it ranges from 1 to 5.9, higher the score the better performance. A capture from Wind Forum. An upgrade to a leaked BIOS v1.07, Wind can even touch 3.6 which is more than half of the total score 5.99! My Wind is currently running on v1.06, I have no gut and time at the moment to upgrade since it's not yet an official release from MSI. Since the performance on Mini is so disappointing and I mentioned wanted to test on it, let's put some hope on its battery. Both are 3-cell battery. For Wind, you can refer here for its battery performance. For Mini, that's about the duration you gain from a full charge. I was using it to browse internet and roughly about 1 hour and 3 quarters (or less but definitely NOT more) before the battery drained out. With so much heat generated from it, this is what should be expected. Also. unlike Wind, you can't deactivate bluetooth while the wireless is enabled on Mini. It's the same button to on and off both wireless and bluetooth. The webcam also can't be disabled on Mini. The battery might go further and beat Wind if such features could be deactivated when unused. 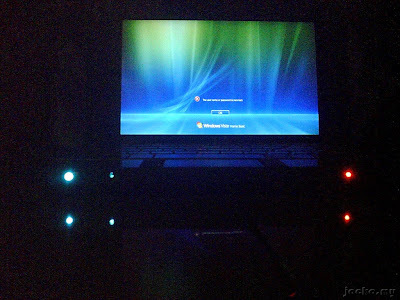 Gosh~ It's so irritating and annoying, especially the harddisk indicator keeps on blinking. Well, on the good side, it looks stylish and futuristic, obviously nothing more than that. Thank you guy. You saved my money and nerves. I was hoping to wait for U120 to be released where i am (Kuwait), but I couldn't wait any longer. So, a couple of weeks ago I bought the U100 (white, 120Gb HD, 2GB RAM, XP Home). Anyway, I like the U100, but i can't get over the poor video resolution... after being used to the 1024x800 on the Fujitsu! I don't understand why MSI couldn't support that on Wind 10" ? maybe technical limitation? I tried the 1024x768, but it just feels weird having to scroll the whole display like that. I also noticed that when I type in MS Word (or even Open Office editor), the letters do not appear as fast as they should which is a bit annoying. It's like there is a delay somewhere. I tried disabling spell/grammer check as-you-type feature, but no use. This is a bit annoying because one of the primary use of Wind for me is to touch type seminar/class notes which I need to do fast enough to keep pace with the speaker. Hmm.. strangely, I just tried Word again, and this time the typing is 'normal' and not that delayed... maybe some condition when I tried it was affecting it... will keep testing. Yeah, I agreed that 1024x600 for netbook is not ideal, if we could get 1024x768 for Wind just like HP Mini 2133 that would be perfect. Perhaps cost measurement that 1024x768 screen is more expensive. On Word matter, you may try to disable some unused auto-startup applications and services, or disable auto scan of antivirus on Word program. 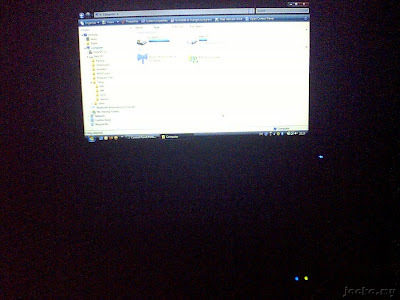 If I were you, I usually reinstall the OS fresh when I got the machine, to remove unnecessary apps and services. 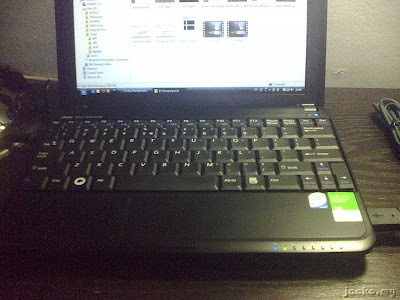 Considering to get a netbook. Your MSI-Wind posts helped. Thanks. Before these I'm worried about the brand MSI. What you think about the after-sales-service? MSI & HP same? Different countries have different distributorships and hence different service levels. If you are in Malaysia, HP has better after sale support if you are in Klang Valley. It has an established service center where you can walk in yourself at Wisma HP in Damansara Height. However, do you really want to get a sluggish machine and ask for better support after your purchase? If you really consider HP Mini 2133, I may want to sell off the HP Mini 2133, still under warranty, buzz me if interested ;) Or try consider HP Mini 1000. If you want MSI Wind, try to ask if the unit is from distributor MediaForte, MF has a service center at 3 Two Square, quite good service. Don't get from other distributor like ESI, lousy after sale support.